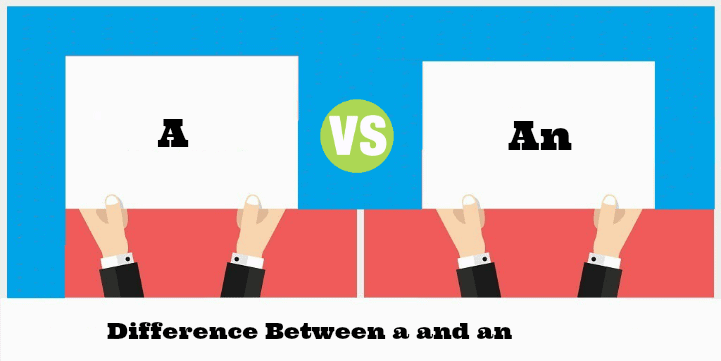 Summary: Difference Between A and An is that A is used when the first letter of the word following has the sound of a consonant while An is used when the first letter of the word following has the sound of a vowel. “A” and “An” are indefinite articles; they indicate nouns that is one of many. A is used before all words that start with a consonant sound. An is used before words that start with vowel sound. Vowels include (a, e, I, o, u). Sometimes vowel deviates from this rule as they sound like consonants. So even if a consonant sounds like vowel we will use ‘an’ before it. ‘An’ is not used with ‘U’ when ‘U’ sounds as ‘EU’ a consonant sound. In this case ‘U’ is preceded by article ‘A’. Article ‘A’ is used instead of ‘an’ when ‘O’ sounds as ‘W’. When ‘EU’ or ‘E’ sounds like ‘Y’ then ‘A’ is used. When ‘H’ is silent then general rule is not followed so here ‘A’ is not used. When ‘U’ sounds like ‘Y’ then in this case A is used instead of An. I saw a tiger in jungle. I spent an hour writing the article. Mr Ali is an honest man. It is an honour for me to be the part of your organization. I will be there in an hour. A one-legged army man walked in. This is a one man game. He is a European national. This a European league football championship match. When not to use Articles? Do not use a/an before names of meals like lunch, dinner, breakfast. We do not use a/an before uncountable nouns like air, water, advice, music etc. We do not use a/an while talking generally about school, college etc.